A couple of low-calorie sugar substitutes have become popular in recent years: stevia and xylitol. Also, many health-conscious bakers use mashed fruit or fruit concentrates to sweeten baked goods. This zero-calorie option (derived from a plant in the sunflower family) is far sweeter than sugar and not good for baking at temperatures above 390˚F (200˚C). Also, some types of Stevia may leave a bitter aftertaste. There are some health concerns surrounding Stevia that need to be balanced against the health benefits of cutting sugar from your diet, though these problems were identified in animal rather than human studies. (see Are Stevia and Agave Syrup Healthier Sweeteners Than Sugar? and Stevia Is Sweet, but Is It Safe? for more information). If you do bake with stevia, you’ll have to make significant recipe modifications. A Stevia-sugar conversion chart is available at Stevia.net. This lower-calorie sweetener (around 40% fewer calories than sugar), which is derived from various plants including birch, berries, oats, mushrooms, or corn (often genetically modified), has some added health benefits such as reducing the levels of bacteria in the mouth that cause tooth decay (see WebMD’s Xylitol page for more information). Xylitol can be used in baking (substituted 1 for 1 with sugar in the recipe), though it may affect the texture and appearance of baked goods, and it shouldn’t be used with recipes that require yeast. It also won’t caramelize, so don’t use it with any recipe that requires a crunchy sugar (e.g., crème brule, hard candy, crisp sugar cookies). Note: in large quantities, xylitol can act as a laxative, so consume it in small amounts initially to see how your body reacts. It’s also poisonous to pets, so keep it away from your furry friends. Fruit is another lower-calorie option that has the added bonus of increasing the nutritional value of baked goods (mashed fruit can be used to replace fats in recipes as well). 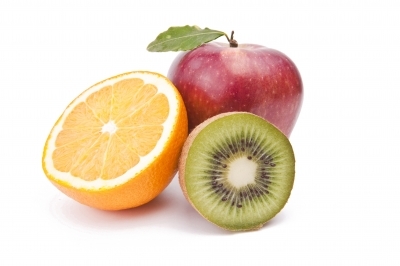 Fruit provides antioxidants, fiber, and other healthy nutrients. There are fruit concentrates available for sweetening baked goods, but choose organic if you go with this option (pesticides are also concentrated in non-organic fruit concentrates). Keep in mind that the mashed fruit or fruit juice will impart its own flavor to the baking mix, so make sure to choose something that goes well with the other ingredients in the recipe.